Bob Somerby likes the column, but he’s annoyed that Miller says he doesn’t understand why the rest of the press corps keeps giving Paul Ryan and his congressional colleagues a pass on this. Early in his column, Miller says he doesn’t understand why the press corps won’t criticize Republicans on this point. He doesn’t understand why they present Ryan as “courageous,” as “visionary.” And then, a mere six paragraphs later, Miller shows that he does understand! He says there’s a “meme,” a hunk of “conventional wisdom,” driving the press corps’ conduct. Miller doesn’t explain just what this “meme” is, nor does he explain how it got “established” as conventional wisdom. But presumably, he is referring to the Standard Press Novel in which Republican budget cutters like Ryan are inevitably said to be “courageous,” “bold” and “honest”—in which their contradictions and errors, no matter how severe, end up on the cutting-room floor. These “memes” have been ruling much of our “journalism” for a good many years. To see this Standard Press Novel at work, just read through Jeff Zeleny’s “Political Memo” in today’s New York Times. Hmmm. Yes. The Zeleny hagiography is worth reading. If you don’t feel like instantly canonizing Ryan after you’re done, you just haven’t read it closely enough. You’d barely know the guy is even a politician, let alone a standard issue conservative ideologue pandering to his base at every opportunity and waving around all the usual bogus Heritage Foundation crap that all the rest of them do. 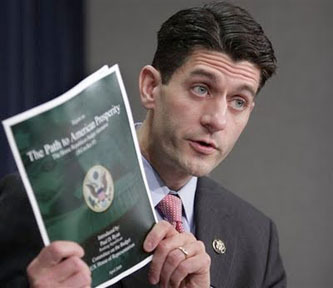 That piece of the Paul Ryan Story just isn’t part of the narrative.